As Coca-Cola song says - Holidays are coming! This is a hot sales season for the online store owners. To make the most out of the holiday rush, it is better to prepare your store in advance. The procedure is individual for everyone due to the peculiarities of store and website and general business strategy. Here are some tips that may help you get your store ready for holiday season quickly and effectively. Products search is a crucial aspect in every store, as you want to provide the customer with the convenient shopping experience. It is especially important before holiday season, as customers are not willing to spend much time on random browsing. Site navigation must be as easy and convenient as possible. You should optimize product items so that they appeared on top of search results. With this aim update product names. A good way is to include holiday meta tags to the source of your homepage. It will bring more traffic to your site. Also pay attention to product description. Make it optimal for both - new customers and patrons. Add links to items descriptions to navigate customers to cross-sells and related products. Correct product search optimization will help you increase holiday sales. Holiday mood should be seen and felt at your site to make it work for your benefit. It can be reached in several ways. First of all, the design is what creates the atmosphere. WordPress design themes are modern and fully customizable. For most solutions, like Magento cart, PrestaShop or VirtueMart platform you will find plenty of paid themes to modify store design. With hosted BigCommerce platform you can choose from more than 100 design themes already available. Apart from design, you may also add some holiday graphics to your logo and banners, create special newsletter templates. It is also recommended to create special gift sections or landing pages if it is appropriate for your business. Before and during the holiday season your store will have more traffic than usually so you should optimize the performance of your site. This includes optimizing store on server level, which will make load speed higher. You can address to hosting provider to optimize the settings accordingly. If your online business involves selling internationally, you should provide customers with localization opportunities. First of all your shopping cart should support multiple languages and currencies. You will get this feature with most of the popular carts, including open source solutions as OpenCart, Magento shopping cart, and hosted ones - Shopify, Volusion cart. Also provide your customers with various shipping opportunities. Remember, that time of delivery in the “hot” holiday season is important, so specify these terms for your buyers. You can provide them with conditions of free shipment (in case of buying some amount of products for example). No matter what is your business specificity, content plays a crucial role on your website. And before holidays it is a good idea to fill site content with useful information. If you have a blog you can add thematic posts like “10 Gift Ideas for Your...” or top lists of your store products. Check the existing content on your site in order to minimize content duplication. Create original content for product pages (at least for best sold products). Adding user FAQs, reviews and testimonials is also relevant. Social media is the latest word in eCommerce. A lot of shopping carts provide the opportunity to spread the information over Facebook, Google or other sites, promote your products, share images, etc. 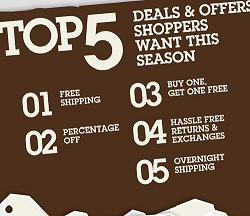 This is an easy and effective way to attract more customers to your store before holiday season. The hosted carts such as 3D Cart, BigCommerce cart, Volusion platform and Pinnacle cart offer Facebook integration. The opportunity to sell and promote via Facebook and Twitter is offered by Magento eCommerce solution. There are actually a lot of options for you to choose the Best Shopping Cart for Social Media Marketing. The user should be facilitated and supported during the whole shopping process. Thus, you will win their trust to your store and make them return again. Also you should provide multiple support channels for your customer convenience - telephone contacts, e-mail or live chat. Make a research of the shopping tendencies to prepare in advance and meet your customers’ requirements. Here is for example the extract from PrestaShop Holiday Shopping Forecast Infographics which shows what the customer will probably search for. 9. Start preparing to the holiday season right now! Providing certain changes timely will guarantee competitive advantage to your store, pleasant shopping experience for buyers and increased profits for you! 10. If you are planning store migration to another platform - don’t hesitate! Right now is the right time to establish a store on a desirable platform and meet holiday season with new and improved shop. Cart2Cart will make data transfer smooth and quick. You shouldn’t worry neither about errors or data loss, nor about store downtime. Start Demo migration right now and in a few hours you will have your new store up and running successfully.